Song Nelson is a multifaceted, multimedia, performing artist. After years of formal training in dance, Song’s creative blessing-in-disguise came as a debilitating bicycle accident. So began an unexpected, interdisciplinary journey investigating somatic practices, voice, theater, songwriting, sound design, and pioneering with dancers with and without disabilities. She has produced and performed work in Santa Cruz for over 20 years. Song’s work reveals an abiding fascination with human vulnerability and the natural world. Song completed her MFA at Bennington College in 2004. Her thesis, Scaling Greenwall, was a culmination of her investigative processes integrating: voice, movement, sound design, sonic-costume design, and architectural instrumentation. In 2014, as the 418’s Choreographer in Residence, Song produced MATRILINEART, Self-Portraits from the Milky Way, a full length, multidisciplinary work delving back into her maternal creative legacy. As a movement educator and a guild certified FeldenkraisTM Practitioner, Song integrates extensive training in physical theatre, dance improvisation, authentic movement and Linklater voice work. Song has taught in universities, colleges, elementary schools and to individuals with and without physical challenges. 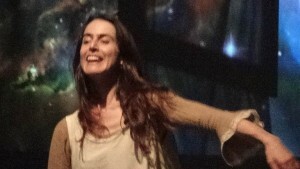 Specializing in voice and movement education in the performing arts, Song’s unique teaching cultivates presence, spontaneity and embodied creative process. She is currently offering public and private Embodied Voice sessions in Santa Cruz. Song lives and works in Santa Cruz with her beloved daughters/muses and husband of 20 years.